This year, the celebration of Hanukkah begins on the evening of Tuesday, Dec. 12, and ends on Wednesday, Dec. 20. Even if you’re not Jewish, you probably know about the lighting of the menorah. You may even be familiar with some of the foods eaten during this celebration. But there are some things that may surprise you about Hanukkah. This week, I’m letting you in on some interesting facts connected with the celebration of Hanukkah. Sufganiyot, or jelly doughnuts, are eaten in celebration of Hanukkah. In fact, 17.5 million sufganiyot are consumed in Israel during this holiday. It wasn’t until the 1920s that this treat was made the official food of Hanukkah by the Israeli Labor Federation. Other popular foods eaten during Hanukkah include latkes, kugel, rugelach, and applesauce. Playing the dreidel game is a tradition many Jewish families enjoy during Hanukkah, but there’s a lot of significance to the story behind this simple game. In 168 B.C., ruler Epiphanes IV tried to abolish Judaism in Greece. Many Jewish people gathered together in groups to read the Torah, but if Greek soldiers passed by, the group would take out a dreidel and start playing with it to disguise their activities. Hanukkah was first officially celebrated at the White House by President Jimmy Carter in 1979. Since then, there has a been a yearly ceremony to light a menorah at the White House. There are 16 ways to spell Hanukkah! After “Hanukkah,” “Chanukah” is the next most popular spelling. The abundance of spellings is due to the fact that there isn’t one standard way to translate Hebrew characters into English; spellings vary based on how people decide to spell out the word’s pronunciation in our alphabet. As a Jewish celebration, Hanukkah is less important than Passover and Rosh Hashanah, but this celebration gained more importance during the 20th century. Many Jewish families celebrate Hanukkah because it usually happens during the winter break from school and takes place near the Christmas holiday. Hanukkah doesn’t occur at the exact same time each year. It starts on 25th day of the Hebrew month of Kislev, which can fall anywhere from late November into December on the Gregorian calendar. In 2013, Hanukkah took place at the same time as Thanksgiving. Can you imagine all of the wonderful foods on Thanksgiving and Hanukkah tables that year? I would’ve savored a plate of sliced turkey with a couple of latkes and applesauce on the side! If you’re looking forward to a repeat of this double celebration, you’ll have to wait until 2070. 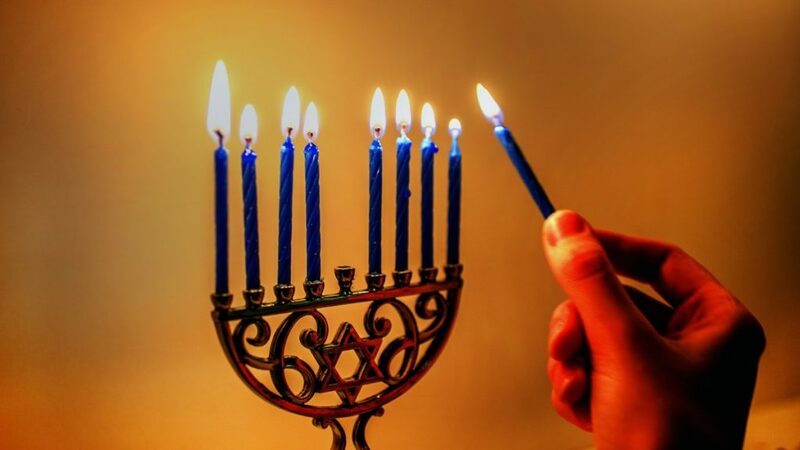 Many Jewish people light a menorah during Hanukkah just as they were lit in the First Temple. But nowadays, menorah candles are available in a range of different colors and even scents, including sufganiyot. Did you know that the word “Hanukkah” means “dedication”? The name refers to the reclaiming of the temple from the Greeks. Hanukkah is a reminder for Jewish people to remain dedicated to their traditions and heritage. I think learning about the stories behind certain traditions can make a celebration all the more meaningful. Don’t you?